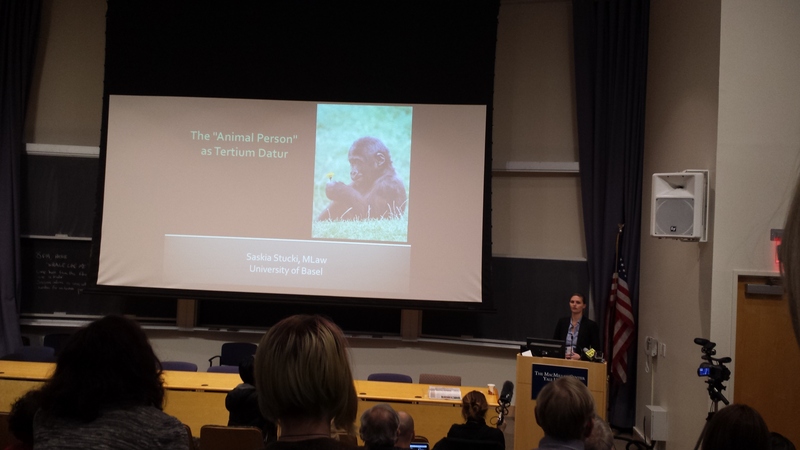 A couple of months ago at Yale University, a group of smart, passionate, well-informed people gathered together to discuss what will likely become one of the discursive focal points of the next century in bioethics and scientific thought: granting legal personhood to non-human animals. 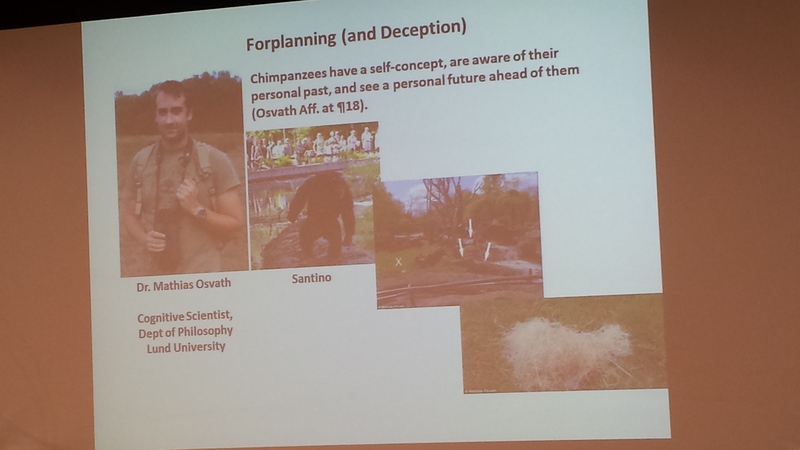 The conference was sponsored by the Institute for Ethics and Emerging Technologies, a non-profit think tank, and officially endorsed by the Nonhuman Rights Project, who just so happened that very week to be (and is still now) prosecuting a number of cases in New York courts on behalf of Kiko, Tommy, Leo, and Hercules, chimps living in Niagara Falls, Gloversville, and in a research lab at Stony Brook University, respectively. I was lucky enough to get to go—a great perk coincident to my living on the East Coast this year as I finish my dissertation—and it was eye-opening in a number of ways. It would take far longer than a thousand words (the generally accepted length for science blogs, according to people who assure me you guys won’t read anything more than three pages on the internet) to fully outline the incisive, complex, and sometimes diametrically opposed philosophical wellsprings presented at the conference, and do justice to the often radical arguments made during the course of those three days. So instead, I’d like to focus on the general tone of the meeting, and a few of the representative presentations. So who presented, and what did they say? Lori Gruen, from Wesleyan, took an anthropological approach in pointing out the seemingly “natural” barriers between human animals and other-than-human animals. Spoiler alert: they’re not natural at all. She spoke about the sociological tendencies of humans through history to differentiate “Self” from “Other” via expanding circles of interaction like so: me –> my family –> my tribe –> my nation –> my race –> my species. The important concepts arising from this tendency, which she suggested were either socialized from an early age or built into the way our minds work (or a combination of the two), were dual. First, the development of an entangling empathy that is most strongly felt by those who are around us, look like us, talk like us, and think like us. And second, the rhetorical trap created when we make no distinction between “personhood” (a legal instantiation of rights) and “human” (a physiological marker). Expanding that entangled empathy and recognizing the limitations it placed around our thinking by our own language, she argued, offers the potential to re-ontologize other-than-human animals in our thinking, language, and conversation. Robert Jones, from California State-Chico, tried to work his way toward a non-speciesist definition of personhood, and suggested we had perhaps been going about this project backwards. Rather than try to find “human” qualities in various other-than-human animals species, he suggested we try to pin down what properties we find to be important in our own personhood, and then look for other places those properties are instantiated. Good stuff. Karen Davis, PhD, and president and founder of United Poultry Concerns, talked about the morphological bias present in the current animal rights movement (a justifiable critique that remains legitimate despite the equally valid justification by the NHRP that they prosecute cases on behalf of chimps both because of the plethora of science on their side and the anthropomorphic bias of human beings). Just because non-human animals don’t look like us doesn’t mean we shouldn’t try to empathize with their experience in an honest way. 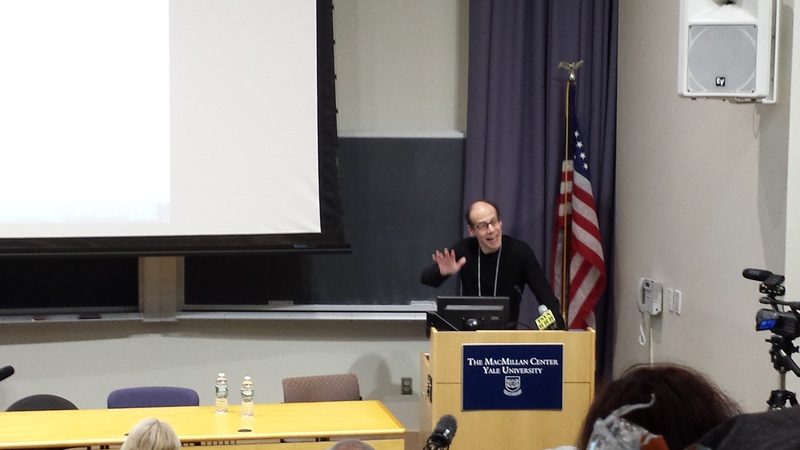 Wendell Wallach, Chair of the Yale Bioethics Center, gave a talk in defense of human exceptionalism that was simultaneously skeptical of technoprogressivism as a movement. He seemed, throughout, mostly concerned that as we proceed down the path of (rightfully, he acceded) giving personhood status to other-than-human animals, we not “demean what it means to be a person.” I thought the talked smacked of a strange romantic conservatism, and had that decided “old man smell” that betrayed a fear of unseating human animals as the center of the universe. Plenty of other interesting and insightful people spoke. Peter Singer, Lori Marino, Stephen Wise, Steve Fuller, Andrew Fenton, Yaniv Heled, and others. That they don’t appear here has everything to do with the depth and breadth of their respective talks—that is, they perhaps raised even more complex and provocative issues than there is space to discuss. Look for another treatment in a future post in terms of how these individuals fit together in exploring other-than-human personhood. But this conference wasn’t only about other-than-human animals. That is to say, it was about more than biological, organic thinking beings. Though definitely underemphasized, it was equally about technological intelligences. 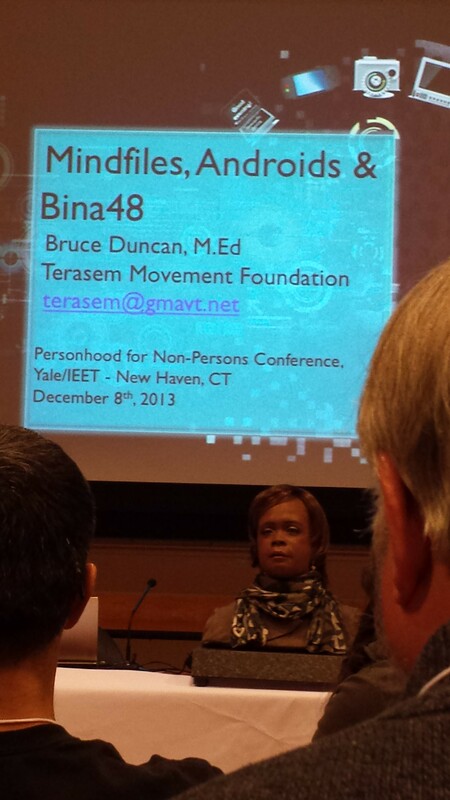 BINA48—perhaps the best-known representative of those forcing us to reconsider paradigm from within which we make value judgments about autonomy, decision-making, and sentience—made an appearance. And she was fantastic. Short for Breakthrough Intelligence via Neural Architecture and built by the Terasem Movement, she answered audience questions for a full half an hour, fielding queries about everything from what she likes to do during the day, to where she goes when she’s shut down, to if she thinks she has a soul. Make no mistake. BINA’s builders don’t claim to have created an artificial intelligence. 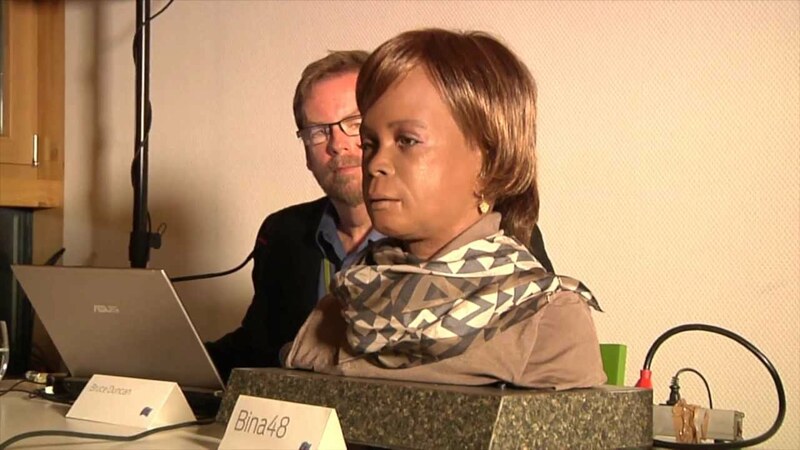 BINA’s remarkably human answers, reinforced carefully by a life-like bust and animatronics, are nevertheless the result of one of the most concerted and well-focused missions aimed at getting to the heart of cognition. And for whole, uninterrupted moments, the mood of the room—populated by lawyers, scientists, philosophers, and students— was one of sincere entrancement, punctuated by verbal and cognitive dissonances that provoked laughter. BINA, her human facilitator explained, was prone to ramble at times, her language and thinking centers building off one another in unpredictable ways. The result was that sometimes she spoke continuously for minutes about having friends, and at other times she gave one-word answers to deeper questions. 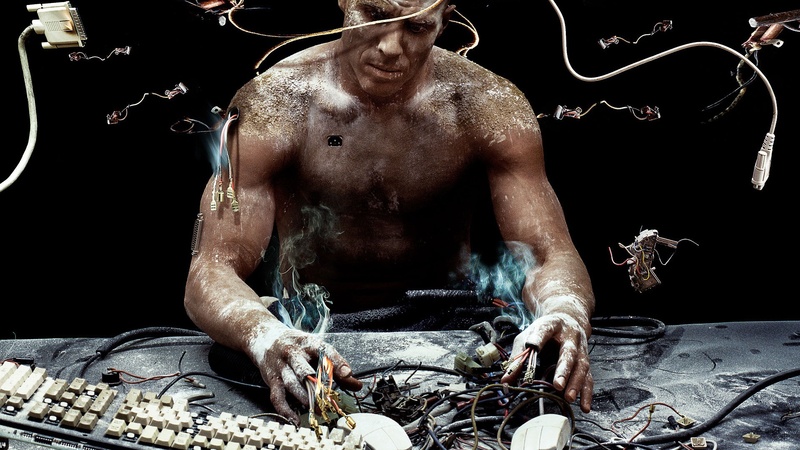 It made me wonder, not for the first time and not for the last, if whether the real question is not going to be between those who say eventually technological intelligences will be able to pass a Turing Test and fool us into thinking they are sentient, and those who say it will never happen. Perhaps, we might wonder if it’s even possible to develop a Turing Test that can tell us with one hundred percent certainty if the interaction we’re experiencing is genuine or merely excellent mimicry. 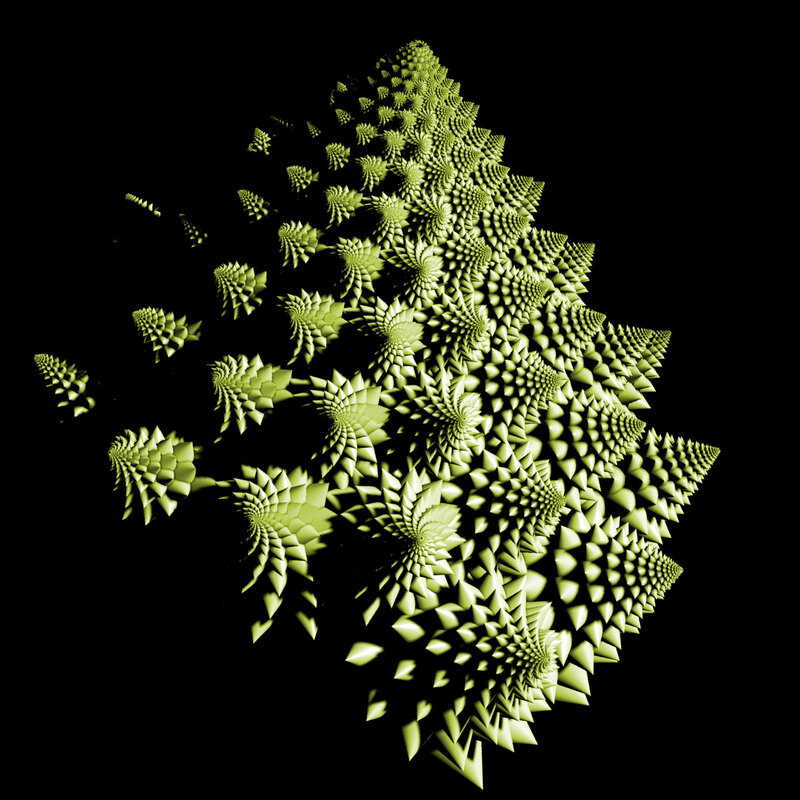 I’ve seen very little discussion which makes me believe we understand the human brain—a computing machine equivalent to a supercomputer (though that remains an incomplete analogy) the size of three city blocks effectively running off of twenty watts—well enough to think our way out of Plato’s cave. This is all philosophically nice, but what’s the science behind personhood? What are some criteria that everyone agrees on for personhood status? Lori Marino of the NHRP was on hand on Day Two to provide some, all of which I heartily agree with. As the science advisor for the group, in charge of preparing materials for the prosecution of their legal cases, she’s uniquely well-situated to speak authoritatively. Part of her challenge lies in educating the public about the flood of scientific evidence showing that other-than-human animals exhibit a host of abilities and phenomena that we had never been able to prove, and which are popularly used to deny them personhood status. These included, but were not limited to, scientifically established recognition of culture, mental time travel, working memory, casual inference, using tools to make tools, self-actualization, self-denial of short-term benefits in pursuit of long-term goals, and others. She was articulate, well-informed, and well-received by the conference attendees. 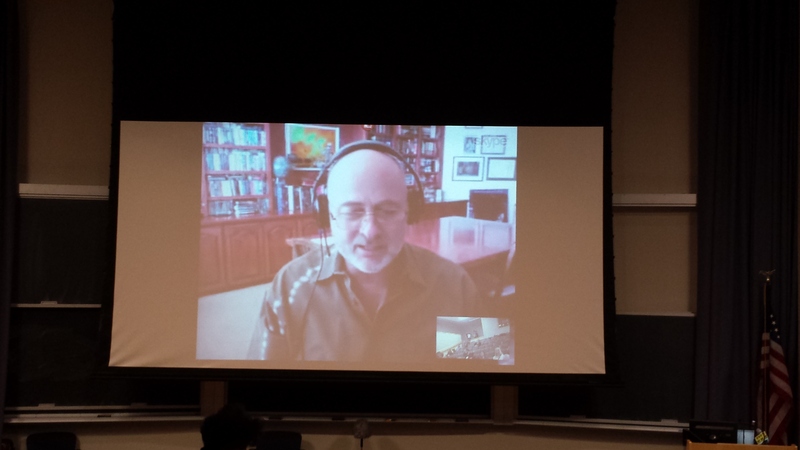 Author and futurist David Brin rounded out the conference via Skype from his study in California. He argued, much to the consternation—and yea, even anger—of the conference attendees, that as the only species on this planet to successfully navigate the Great Filter into undeniable high-order sentience humanity may have an obligation to “uplift” non-human animals to our level. Think of it as a reversal of the Prime Directive. Once our technology enables us to, he suggested, the (moral and philosophical) line of discussion brought up by the Yale conference (he had been following along to the panels remotely) suggested clear responsibilities to life on planet Earth—to aid in the uplifting of as many species as we can determine want high-order sentience. Brin was immediately (and with no little animosity) criticized for suggesting interference by the conference attendees. There was shouting even. This reaction, I thought, demonstrated a large blind spot in their awareness of just how radical most of the ideas they themselves proposed were to the bulk of society. Brin handled it well enough, telling the most vocal that he understood what he was proposing sounded elitist, presumptuous, and even immoral. He reiterated, however, that his suggestion was little more than the logical conclusion of the rest of the conference’s attempt at grappling toward (from a laudable and well-intentioned place that he agreed with, he said) full personhood status for other-than-human animals. And he was absolutely right. This is a debate that’s not going to go away. India just banned dolphin use in entertainment-related activities, and it’s likely others will soon follow suit. PETA, despite the poor public image most have of them, continues its work nationwide, aided by the Humane Society of the United States and others. More people go vegetarian or vegan every year, and as they do, restaurants and grocery stores are becoming increasingly hip to what is clearly no longer a transient fad. You say to them this: No one’s talking about people. They’re talking about “personhood.” It’s a very specific legal instantiation aimed at giving other-than-human animals “freedom from” rather than, as many who pre-emptively attack the activist movement (on the grounds of an understandable but completely outmoded faith to the notion of human exceptionalism) seem to be worried about, “freedom to” (be called people). Freedom from what? Freedom from predation, from being experimented on, from being eaten, and from being otherwise exploited. Recognizing the abilities which other-than-human animals have had all along doesn’t diminish you in any way. It’s not a zero-sum game. 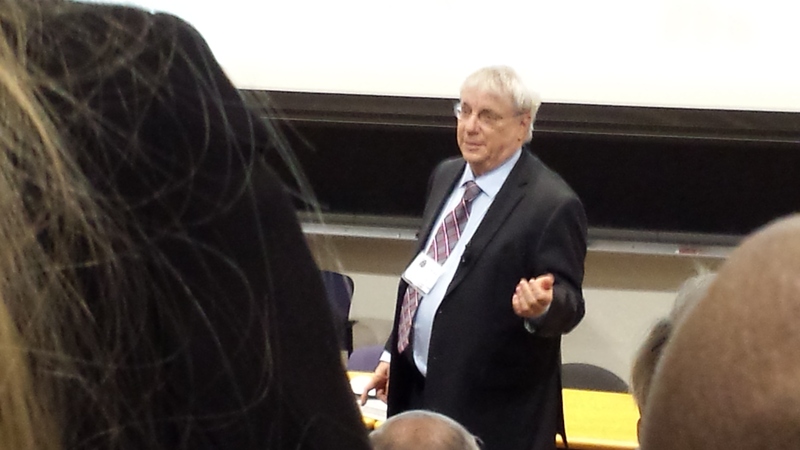 That was the most exciting part about the Yale conference. Because when you get that many smart, capable, and informed people in a room together who want the same thing, no amount of xenophobic hand-wringing is going to keep it from happening.